The ohotos of this sink do jot do it justice. It is nice and heavy. Easily wipes clean. The faucet is plain, but it goes perfectly with the basin. Mine did not have the drain in the box. Customer Service was excellent in getting a replacement shipped to me. I would absolutely recommend this set. Sinkology and Pfister faucets have partnered to make purchasing a quality bathroom vessel sink and coordinating faucet easy. Our design teams have developed All-in-One design kits that include everything you need to install and care for your Sinkology vessel sink. Each nickel sink is hand hammered and plated in our state of the art factories. The polished nickel finish on our bathroom sinks is luxurious and durable, we even protect all our bath sinks with a Lifetime Warranty. Pfister faucets also protects all their faucets with a Pforever guaranteed that protects finish and function for life. 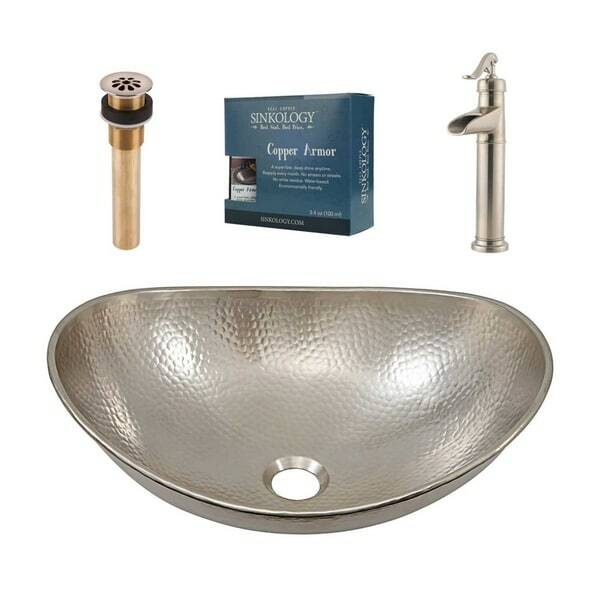 Also included with your Hobbes all-in-one design kit is a high-quality copper sink and nickel cleaner and wax. Dimensions:19" x 14" x 7"
Bowl dimensions:18.75" x 13.75" x 6.5"
"what is the height of the faucet?"